Pies are not something that we have too often in our family. They are a treat. The name of this pie really appealed to me as our family all enjoy blue cheese. 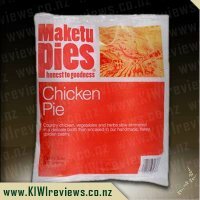 The description on the front of the pie gave me the impression that this pie would be rather tasty and good quality. 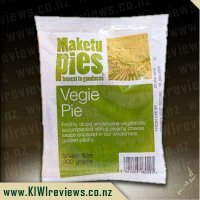 It says that the pie is a snack size, (250g), but I would consider that a meal which just requires a good sized salad or side of vegetables for dinner. My husband cooked this according to the directions and it took a lot longer than stated on the packet. 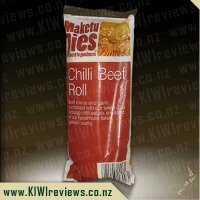 The interesting thing is that the chilli roll of the same brand cooked as per the instructions on the pack so we had expected that they would cook in a similar way in the same oven. I am not sure if this was the fault of our oven or not but you would think that the chilli roll would have suffered the same delays if it was the oven. Our family of four were sharing one pie for tasting purposes. We could easily have had one each as the children loved it and kept asking for more. When I cut the pie in half it stayed together nicely. I was even able to cut smaller wedges off with success, to share amongst our family. It took my husband a little while to realise that there was actually blue cheese in the pie. I had noticed it because I took the lid off mine piece and I ate the pastry separately. 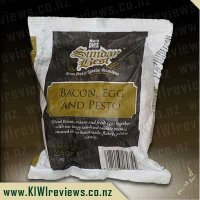 Once I tasted it and pointed it out to my husband, we were both much more aware of the yummy flavour. Perhaps a little more blue cheese would have made us more aware of it from the beginning. I liked the pastry on the pie and found that it was nice and flakey without being dry. Inside the pie, I found that there were pieces of tender beef and onion. The meat was nice and easy for children to eat as it was so tender. We found that the gravy was a bit gluggy and didn&apos;t have a huge amount of flavour in it. It did, however, allow the pie to stay together nicely. I didn&apos;t find the pie overly greasy, which can be a downfall of a pie. We served this pie with some crunchy salad and some steamed green vegetables. I found that the salad and vegetables complemented the pie nicely and balanced out the meal. 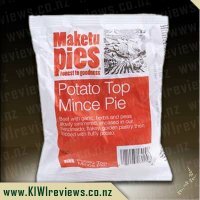 Overall, our family liked this pie and would prefer to have a little more flavour in the gravy and a little more blue cheese. In fact, either of these would make it a perfect pie in our eyes. The big-boys version of steak and cheese is the way I would describe this pie. 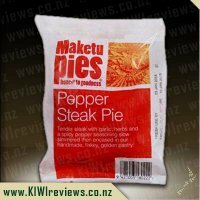 Because I live in Whanganui I would normally not be able to review things like this, but I was up visiting whanau in the Waikato recently so had the chance to drop in and collect a box of reviews goods that included the food from Maketu Pies. 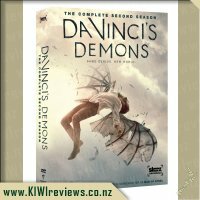 I am very glad I did, because it meant I could relax and trial these without my darling mokopuna dropping in to say hello just after the courier has been, as they so often do. I have dentures, and not very good ones at that, so some foods are too much for me to handle. Anything with seeds or lots of fibres are just gum pain waiting to happen, for me, so I wasn&apos;t too sure about eating this pie. 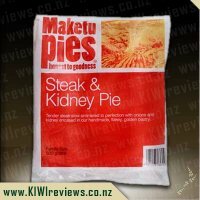 Steak in general, ,especially the tough, fibrous stuff you get in most pies, is something I find really unpleasant to deal with. But, this pie was an exception, as I found out. The beef is chunky, true. Big, tasty, appealing chunks that make the pie look as good as it smells. More importantly, for me at least, was that the beef was so tender it fell apart and didn&apos;t cause me to put on the hard bite which always means gum pain afterwards. There was also quite a lot of it, and only enough gravy to keep the pie moist. It was, in fact as well as name, a beef pie with gravy, not a gravy pie with a sprinkle of beef. I was not a big fan of the blue cheese though. I have never really learned to appreciate the taste of blue cheese. It reminds me too much of the cheese I had to deal with during my time in the army - old socks and someone&apos;s second-hand lunch is all it usually smells like to me, eh. But don&apos;t get me wrong, that&apos;s not how the pie smells - the pie smells pretty amazing actually. It was more a case of my issues with blue cheese, and had nothing to do with the pie really. It tasted pretty good really, but my own personal issues stopped me from really appreciating and enjoying the pie as much as I think others will. Still, for those who want something different than a $2.00 steak &apos;n cheese pie from the dairy, this could be a pretty good way to go, eh. 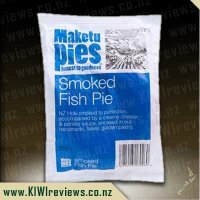 I have seen the Sunday Best pies around in supermarkets before, but not the full range. 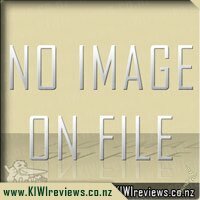 The pack stand out well, with it&apos;s distinctive black with gold and white. The colour scheme definitely glams this pie range up. 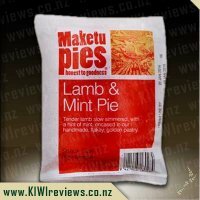 I was interested to see what this pie would be like. I am a steak and cheese pie eater primarily. I am not a huge fan of blue cheese but I am always going back to taste it just in case my palate has changed. I cooked this pie in our gas oven from frozen for 40 minutes. When I cut into it, it was still cold but it was defrosted. I don&apos;t believe that was related to the instructions on the pack. Our oven can be a bit iffy, so I expected it to be pretty cool inside. I tried some of the pastry top and found it to be crunchy, and buttery. A really good flavour. I did then need to microwave the pie a little just to warm the centre. The steak pieces inside were a good bite-size. The gravy was really flavourful too. The blue cheese was melted on top of the meat filling, between the top of the pastry. The look of the cheese was a bit strange, but I haven&apos;t seen blue cheese melted like that before. The flavour was 100% blue cheese. It wasn&apos;t unpleasant and if you were really into blue cheese I think this pie would be a huge hit with you. 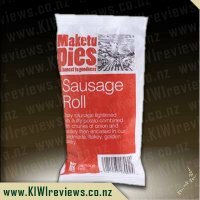 This pie was my favourite out of the two pies in the Sunday Best range I tried. Despite not being totally into blue cheese, I believe I would buy this pie again. I was impressed with the quality and taste. This would be great as a snack or lunch, but also as dinner with mashed potatoes and vegetables. 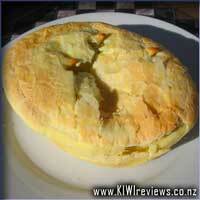 For many, many years I have been an aficionado of the Steak &apos;n&apos; Cheese pie. I don&apos;t think I can count the number of variants on that basic combination I have eaten in my time... but this would have to be the most unusual, and by far the best! 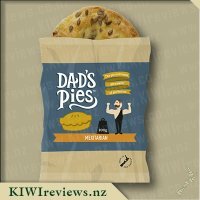 I had the pleasure of trying on of these fresh out of a proper pie-warmer at the Food Show in Auckland, and had a chat with some of the people behind the brand - those who have probably forgotten more about pie making than I have ever learned. It helped me to really appreciate this pie. 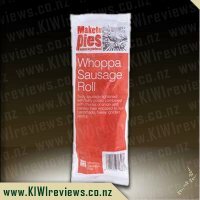 Big chunks of tender, slow-cooked beef steak, onions, a thick and tasty gravy - but not too much of it - topped with real blue-vein cheese and wrapped in a delightful, light, buttery pastry... and then, because my oven is big, clunky and wasteful of power... I go and microwave mine. Even with the brutal radiation assault applied to it, this pie proved itself to be simply stunning. The pastry stood up well, remaining delicate and buttery as long as it held some warmth, and the filling was something I struggle to describe without sounding all fan-boy. 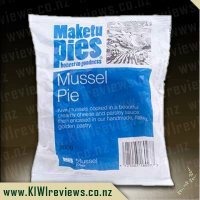 Overall, an amazing pie which some will adore, and I am sure some will never try because of a fear of blue-vein cheese tasting more like "mouldy" cheese. Their loss, more for me. Normally I am not a big fan of blue cheese, but this pie was an eye-opener, or rather a stomach-dilator. I found that the flavour of the cheese sauce was only mildly tangy, in fact, against the flavour of the meat, it was almost undetectable. I found that the steak was tender, it had a low gristle content, meaning it didn&apos;t require a lot of chewing. Although the packet does NOT have any instructions regarding using a microwave to heat this pie, but nonetheless, I still managed to heat the pie successfully at about 2-3 minutes on high, CAUTION: This time may vary from microwave to microwave, so I suggest starting off at 1 minute and then working your way up by adding mall increments of time. The pastry was soft, it wasn&apos;t so flakey that it all ended over my lap, but the lid had a slight flake to it, giving a bit of an interesting appearance. After being heated, the fillings release a lot of the heat through radiation, meaning that there was a low oil content, and as a bonus I didn&apos;t have to wait that long after heating to a sufficient temperature for it to have cooled down enough for me to eat without burning the inside of my mouth. The overall flavour of the pie was good, despite there not being enough of the blue cheese taste in the pie, although I&apos;m sure it must have added some sort of rouge element which may or may not have improved upon the flavour. 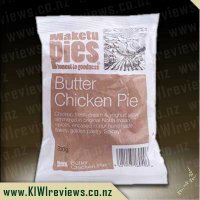 Overall, I am above happy with the quality of this product, and I wish to try and find another of these pies, although for something like this, I expect that it might make a dent in my wallet! 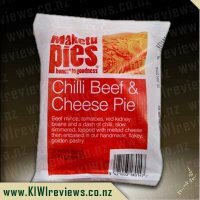 I was given this pie to review, and like all the Maketu pies that I have been given to try, they don&apos;t recommend microwaving it - so much so, that they don&apos;t even give instructions for that option. 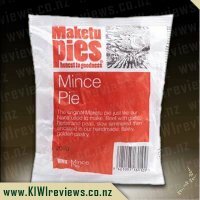 Previously I did microwave one, as lets face it, pies are the perfect food to grab and take to work and most don&apos;t have the luxury of an oven at work. And to be honest it was perfectly fine as I knew the pastry wouldn&apos;t be at it&apos;s best and I was fine with that. This time however, I decided to follow the instructions and oven bake it. Because I was doing this from frozen, according to the packet I needed to cook it for at least 45 minutes which meant it was quite a feat just to have a pie fix! However I have to say it was well worth the effort I made. Hubby and I split the pie as part of a meal and he declared it the best pie he&apos;d ever eaten. He wants to know how to get hold of more! Although hubby has always been a blue cheese fan, it&apos;s not something I&apos;ve ever been game to try before tonight, so I was venturing into new territory. For this reason I was glad the blue cheese portion was very small and mild. I was happy with this, but hubby would have happily had more - he found some mouthfuls had the cheese and others didn&apos;t. And it turns out I like blue cheese - yay to this pie for expanding my horizons! We both agreed the beef was definitely a prime cut as advertised - there was no fat or gristle to be seen and it was beautiful to eat. The oven cooking definitely made a nice job of the pastry and there was a pleasant after taste without any greasy feeling being left in the mouth as some pies can do. 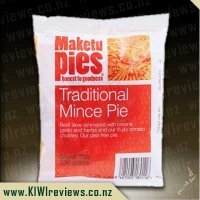 The pie was a decent size for a single serve and it looks like hubby will be ensuring I buy some of these to keep in the freezer! 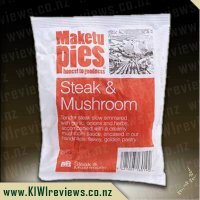 This is the pie I was looking forward to trying the most as I love blue cheese and usually when there is steak there are only little pieces but this time when the pie was cut in half as a friend and I were sharing, we could see and both commented on how nice it was to see a lot of steak and decent pieces. I did like the taste but would have preferred to see a bit more of the cheese as I found that there wasn&apos;t quite enough cheese and the taste wasn&apos;t as strong as it could have been. 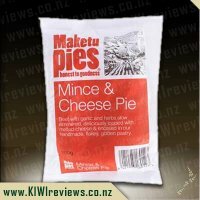 There is not much that could be done to make the pie more enjoyable apart from a bit more cheese. 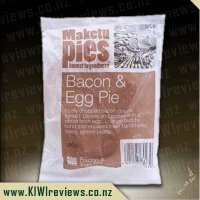 I would be interested in buying this as it was a decent size pie and good taste, it just depends on how easily available the pies are and how much I would be expected to pay for it. Again I would have preferred the option of being able to microwave the pie as it is a lot faster and easier than trying to heat up the oven and keep the kids happy and out the way. I do understand that the pastry wouldn&apos;t taste quite right and it wouldn&apos;t be as flaky but I would be prepared to compromise for the convenience of using a microwave. 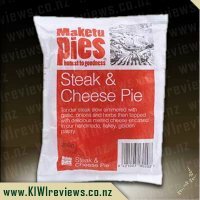 I wanted to try this because I love steak pies and was curious about the blue cheese so I split this pie with a fellow reviewer. My first thought upon seeing this was just how much steak there is in this pie, far more steak than I was expecting as usually when I get a steak pie you get one or two piddly little pieces that don&apos;t always taste that great but in this case it was full to the brim of steak which was lovely and tender and juicy and perfectly balanced with the amount of gravy and herbs. When I was eating this I could definitely taste the blue cheese, I found the flavor to be very strong, nice, but really strong and I did comment on it that I found it a bit overpowering when I had a bite that had more cheese in it than anything else, but when evenly matched with the other ingredients it tasted really really nice and everything complimented each other really well. It was a well blended taste of gravy, meat, herbs and cheese, the pastry was flaky but tasted nice and matched the pie well. I would buy this again and I&apos;m hoping I can find it in the store soon. This was the item I was really looking forward to reviewing. A new take on the classic steak and cheese. 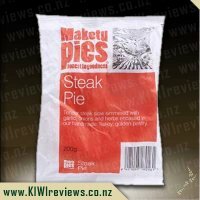 Steak & Cheese is my all-time favourite flavour of pie, so I had some high expectations. This product again required oven baking, as no microwave instructions were provided, but I was so excited to try this one, that I really didn&apos;t care. I wanted it to be perfect. 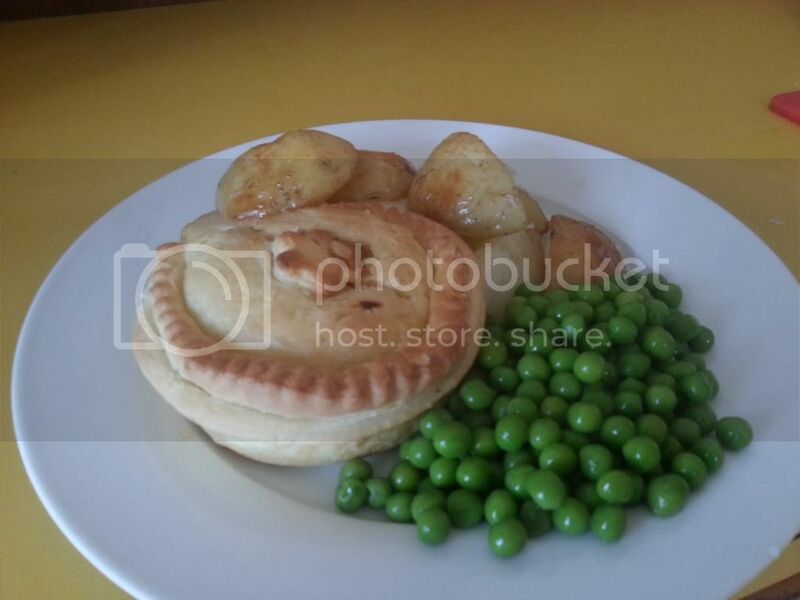 I served this meal with some roasted potatoes and peas, and in comparison to the potatoes, the pie didn&apos;t feel like it was cooking for all that long. Cracking open the pastry to open the pie, I could see the steam, and a thick dark gravy oozing out. Thick and dark is the best colouring for a pie gravy; it&apos;s an indicator of strong flavour. The filling was comprised of some large chunks of beef, which I was incredibly pleased to see. The blue cheese provided an interesting divergence in flavour from the usual cheeses applied to pastries these days. It provided a lingering tang, that lasted long after the pie was consumed. 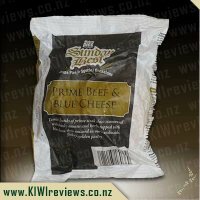 The blue cheese was by far the most dominant flavour in this product. The prime beef provided merely texture, but it did a great job of that, and the filing filled most of the pie cavity. I thoroughly enjoyed this pie. I just wish it was larger, so that there would be more to eat.